The Vestax PMC-08 PRO is a high quality 2-channel mixer with a fully adjustable crossfader and digital sound quality. 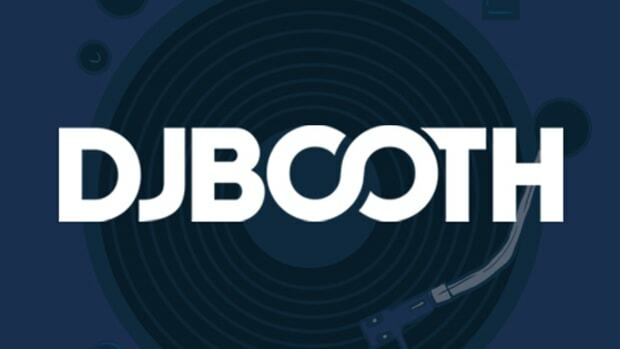 DJbooth.net has finally brought Vestax DJ equipment aboard and DJbooth.net will now be bringing you DJ equipment reviews as soon as Vestax drops new products!!! I would first like to give a HUGE shout-out to Mindy at American Music and Sound (the company that handles Vestax distribution in the United States) for allowing us to review this exceptional line of products. Personally, I have always looked up to Vestax for their groundbreaking products and great attention to quality and detail. The Vestax team is regarded as the BEST manufacturer of DJ equipment and is usually at the top of the list for most turntablists and scratch/hip-hop DJ’s. 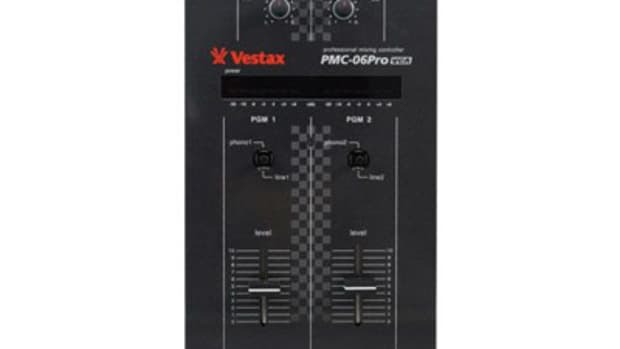 They rarely ever disappoint and the Vestax PMC-08Pro Professional mixer is no exception! The Vestax PMC-08Pro is advertised as a Professional Hybrid digital mixer which promises to give DJ’s the real-time digital performance while keeping the analog interface that today’s demanding DJ’s are in need of. We will put all of these claims to the test! First Impressions/Build: Vestax brought in their world famous DJ’s (DJ Q-Bert and the Skratch Piklz) to put together the ultimate turntablists mixing machine; and at first glance, that is exactly what they did! Initially, you may see the Vestax PMC-08pro as a Vestax PMC-07pro on steroids, but this mixer was built brand new from the ground up. The 08pro is one of the heaviest 2-channel mixers I have ever used; if not the heaviest. This shows me that every component they put in this mixer was built to last and withstand the punishment of scratch DJ’s and mobile DJ’s alike. The very front of the mixer has two heavy duty silver vertical bars for transportation uses and also to block the DJ from accidentally changing the fader setting while in use. The two silver bars actually add to the tough construction of this very sturdy mixer. This mixer is slightly wider and longer than my normal Stanton SA-5 mixer, but is still perfect Battle size and sits comfortably inside my normal 10-inch mixer case/coffin. Front of the Mixer: The front of the mixer is totally dedicated to the Crossfader and Linefader adjustments. The only other item in the front of this mixer that isn’t for the Faders is the ¼-inch Headphone input. On the front left and to the front right; you will find the adjustments for the left and right channel faders respectively. They have a line reverse switch to change the direction of the Line faders and a very well constructed adjustment knob for the fade curve adjustments. The Linefader curve adjustment knobs allow DJ’s to get the curve exactly how they need it for their particular mix or scratch. In the very middle of the front of the mixer lies the Crossfader adjustment knobs and switch. This is where the Vestax PMC-08 Pro mixer shines above all others! Not only does it have the Crossfader Curve knob and Crossfader reverse switch found at the Linefader adjustments; but it also includes cut control knobs for the right and left side of the Crossfader (channel one and channel two). Basically, the Cut controls allow the DJ to determine the amount of “dead space” (The distance of fader travel before the actual sound comes in) on the right and left sides of the Crossfader. The knobs for the cut control are very tiny and purposely made this way so that once it is set; you don’t accidentally change the setting while performing. Please see faders for more information on the Crossfader Cut Control feature. Back of the Mixer/Inputs: The rear of this mixer is littered with inputs and outputs; more-so than any other Two-Channel mixer I have ever used. 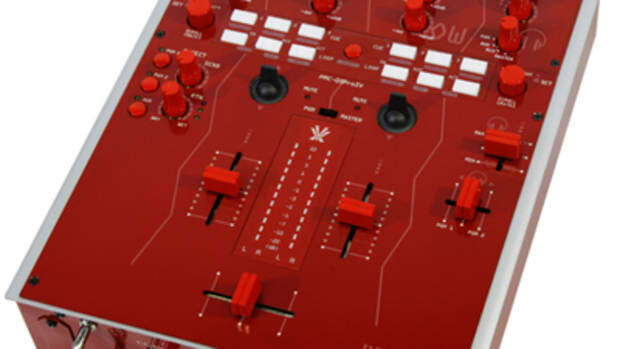 The rear of the Vestax PMC-08 Pro mixer is divided with channel outputs and inputs to the left and Effects Send and Receive jacks on the right. The strong construction of this mixer even comes through in the power cable jack who you must screw down into the mounting bracket to ensure it is never accidentally disconnected. The Power button is at the top left with the Main RCA outputs and XLR Master outputs to the left as well. In the Middle of the rear, we have another RCA Booth output which can be used for monitors in a club setting. There is also a Session Input so you can string other mixers together with this one for Scratch battles or a multi-mixer setup. The MIC input (for the Microphone) is almost smack in the middle and is another 1/4” input. Then there are the two RCA LINE inputs, and two Analog RCA PHONO LINE inputs (one for channel one and one for Channel two). There is a switch above the LINE inputs that allow a user to change the resistor level of the line depending on the type of source you connect to the LINE inputs. In the effects Send/Return section there are two separate Effect sections labeled as EFFECT 1 and EFFECT 2. Each Effect section has a Send and Receive 1/4” Input in the rear. Faders: The heart of any great Two-channel battle mixer is definitely the Faders. The Vestax PMC-08Pro might sure as well have the BEST Crossfader and Linefaders ever made. They are buttery-smooth and glide very freely and quickly across the fader path. The Crossfader is a new Vestax Fader which allows the Vestax-PMC08pro to adjust the Cut-In time of the fader which can either create more dead-space or completely eliminate the dead-space all together (as Turntablists would love it). The first time I tried to make the adjustment, I didn’t have it right, and I thought that this mixer didn’t do what they said it will. But with a little more adjustments to the Left and Right Cut Control and I was able to completely eliminate the Dead-space found on almost all other mixers (unless they have upgraded to a Pro-X-Fader which can also be fully-customizable). The Cut Control can also be set to extremes if you wish. You could set it to where you don’t hear the other source until the fader is all the way in the middle of the fader track. You can even set it to where the Fader has no control over when one source comes in and the other source goes out. It is pretty hard to explain, but the possibilities are endless. A true Turntablist could definitely find some cool uses for this unique feature. When I test new battle mixers; my normal routine is to get about two or three more DJ’s to come over to the crib so we can get a little battle going. So this time was no exception! I brought over my two DJ friends and we went to work on this thing. We scratched, transformed, teared, crabbed, and just straight gave it everything we had. This is truly a turntablists’ paradise. It responded exactly how we wanted it to every time. It definitely made cutting easier (without the dead space), and honestly made us all sound just a wee-bit-better. The Crossfader is also Totally Solid and built to last. I am not sure if this is a lifetime fader, but it definitely feels like one. It is definitely reminiscent of the Magnetic faders found on the Rane TTM-56. The Linefaders of the Vestax PMC-08pro are no different. They don’t have the cut control feature, but they feel just as smooth and free-flowing as the Crossfader. It was easy to pull off CRAB and transformer scratches with the faders as long as the Line Fader Curve adjustments are set correctly. In between the two Line Faders is the LED display. The LED display can show the Decibel level of either Channel one and channel two or you can hit the switch to show Master Left or Master Right output instead. There is also a middle LED level which shows the level of your monitor (headphones). Under the LED’s; the Vestax PMC-08pro has small lights that let you know whether or not any of your three faders are in a Reverse state. These are all great improvements and very helpful to the DJ to let them know how all the levels are and what state the faders are in. Above each line fader is the Transformer switches. The Transformer Switches on the Vestax PMC-08Pro are constructed with the consistent ruggedness of the entire mixer. They are metal switches with a hard plastic type material where your fingers touch the switch. They click perfectly into place as they are moved, but they aren’t tight at all. They are perfect for very quick and precise movements. They are exactly what a Turntablist would want! Knobs/EQ: The Equalizer section of the Vestax PMC-08Pro is laid out like the other Two-Channel battle mixers before it; having Channel one’s controls right above the Channel one fader/transformer switch and the Channel two’s controls right above the Channel two fader/transformer switch. To my liking; the Three Band EQ controls (Low, Mid, Hi) are actually small faders, which make it easier for me to adjust on the fly. The faders are also built to last and tight so that you get the adjustments exactly where you need them. Each set of EQ’s has its own switch where you can set it between EQ (using the faders to get the sound right), OFF (completely turns off the EQ control for a raw sound), and ISOLATOR (adds a unique sound to the EQ control faders and kill feature). An Awesome addition to this mixer is the ability to use the balance faders (same faders as found in the EQ) to move your sound Left or Right. You can do this individually for the two lines (each line has a separate balance control fader). There is definitely a lot you can do with this feature, especially in a club-like setting. Finally, there are the Gain control knobs for each line. Above the Gain controls there are switches to either turn the channel into a PHONO input or LINE input. 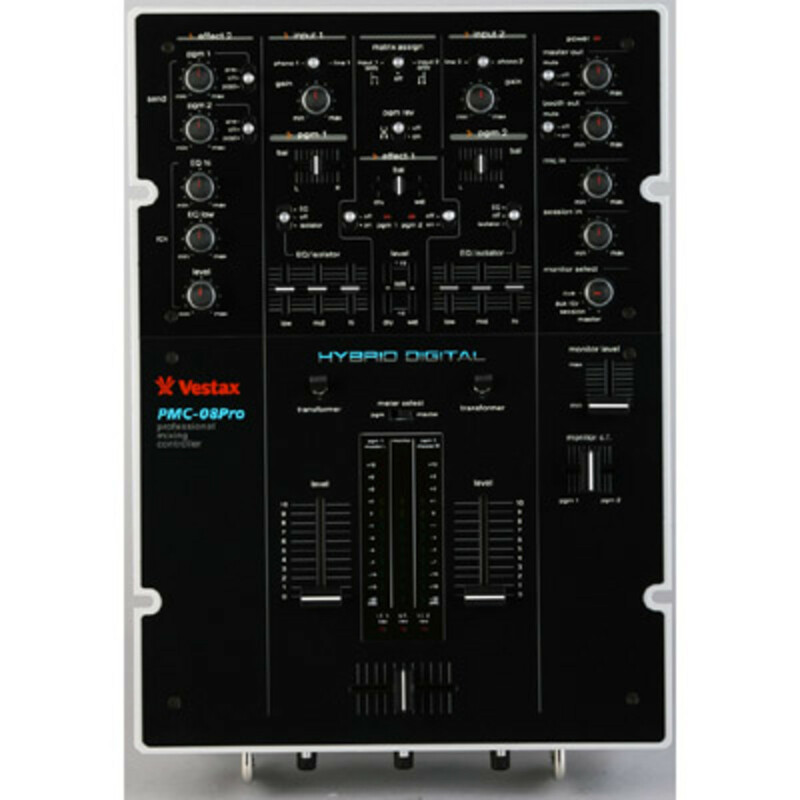 All of the knobs on this mixer are made from a rubber-plastic type polymer which was completely redesigned for the Vestax PMC-08Pro and future Vestax mixers. They are the best knobs I have ever felt on a battle mixer as well. These knobs will be almost impossible to break under normal or Professional use circumstances. The first knob in the top right of the mixer (as in almost any two-channel mixer) lies the MASTER volume control knob. Under that is the BOOTH output volume knob. The Master knob and Booth knob also have a Mute switch next to them just in case you need to cut the sound to either volume immediately. Under the BOOTH knob, is the MIC knob which controls the Microphone level; and a SESSION IN input volume knob so you can play an additional source (i.e. another mixer and deck setup for battles/Team scratching) at a desired level. Monitor section: The monitor controls are also located in a familiar area on the middle right of the top face of the mixer. The Monitor select knob the user can select what they want to hear in the headphones. They can monitor the CUE (using the monitor Crossfader to assign a sign or listen to both depending on where you have the slider), the AUX RCV (the receive effects), SESSION (the session input), or the MASTER output. There is a Monitor level fader and a Monitor Crossfader. These faders feel similar to the line fader (with the same knobs) but tighter in the track (like the EQ sliders) to allow for accurate controlling of what you would like to monitor. Personally I love the fact that they used their high quality faders as much as they could in this mixer to make it easier for me to make my adjustments on the fly. Effects: I regret to inform everyone, but I am and most likely never will be an Effects DJ. I have never used effects and I never review a mixer based on its Effects offerings. With that said…I am sure that the PMC-08Pro can do it all in terms of effects. There is an Effect one area that has separate wet and dry dB adjustments and on/off switches for channel one or channel two. Effect one also has the ability to balance between wet/dry effect. In the Effect two section there is a Send section with channel one and channel two volume knobs with each knob having its own pre, post, or off effect setting. The Effect two section also includes a Receive area which can control the overall volume level of the Receive and an EQ low and an EQ high knob to adjust the volumes accordingly. There is also a MATRIX ASSIGN area of the mixer where each channel has switches in which you can select the option of using two sources from a single Channel while having one source in the channel one area and the other source playing through the channel two area. For example, you can plug a CD turntable into the LINE input of channel one and then plug an analog deck into the PHONO input of channel one and have the CD turntable play through the channel one’s controls; while the analog deck plays through channel two’s controls. This mixer also has the PGM REV (program reverse) function in the MATRIX ASSIGN section which allows the DJ to completely reverse Channel one and Channel two on the mixer. Now that I have steam-rolled through the effects section…let’s move on to the conclusion! Conclusion: After all is said and done; the Vestax PMC-08Pro is the best two-channel mixer I have ever used to date! The unique way you can fully adjust the Crossfader combined with the accurate and fun to use Kill EQ control features make this mixer a top-tier choice for veterans, turntablists, and Club DJ’s! It is also made extremely rugged and very solid which also makes it a top choice for Mobile DJ’s as well. This mixer has very smooth and accurate sound quality. I am currently running two mid-range Cerwin Vega Speakers with a Crown XLS Amp and a Nady EQ with all XLR and 1/4” connections. This mixer even sounds slightly better than my normal Stanton SA-5 (which also sounds great with SuperiorSoundTechnology). This mixer has it all covered, from a solid scratch setup, to complex effects controls…If you want and need the absolute best two-channel mixing console; (and you can afford it…); then look no further as the Vestax PMC-08Pro is the answer to all of your prayers! NAMM 2010 - Vestax PMC-05proIV Mixer Announced! The world's most successful hip-hop/scratch mixer series introduces a new version of PMC-05PROIV. Over the past several years in development, the new 05pro is characterized by a new type of intelligent design. Click the link below to find out more.